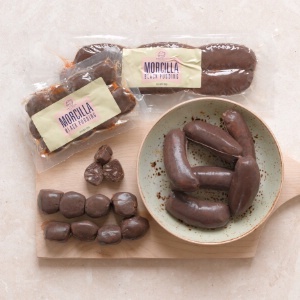 As a further note to Borough Market we went to Brindisa Spanish Deli while we were there and I saw some Morcilla (Black Pudding) my missus said that looks similar to the one from Orange Walk in Belize so I got some. Boy am I glad I did I cooked it up on Sunday with Bacon, Cherry Tomato and Scrambled Eggs it was fabulous just like the Belizean Version yum yum yummmy. I have since found you can buy from them online so why not try it yourself you won’t regret it Brindisa.